When I used to get new gear I would always test it out on my dog Bingo. He has since passed, and I have come up with some new subjects to test my gear on. 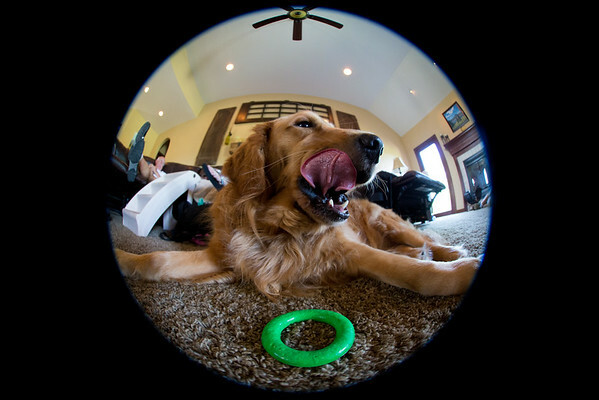 Yesterday I was visiting my brother’s dog Rusty and decided to really give the Canon 8-15mm lens a test. I put it on my Canon 5D Mark III and went up to Rusty to make a photo. At 8mm you really have to get close to your subject to make a picture with some impact. Luckily right when I had my camera up close to Rusty he did something interesting. I have not had much time to use the Canon 8-15mm lens yet. I have liked what I have seen in that limited use though. I have two weddings and a vacation coming up in the near future so I am sure that I will have more to say on the lens after all of that has passed. Right now the 8mm circle is a novel idea to me. Lightroom has a feature where you can straighten the photo out. Right now I am not composing the photos well enough to use that. I need to change how I shoot if I want to use the profile correction feature. I like the lens at about 13.5-15mm for some very wide angle shots. Occasionally I think that the 8mm circle could come in handy on my full frame bodies. On my crop sensor cameras this could be a go to lens.